The squadron patch depicts a bird with outstretched wings. This bird is a phoenix who, in ancient mythology, was consumed by fire and resurrected from its own ashes. As VA-128 was created from VAH-123, in 1967 the new A-6A Intruder replaced the A-3B Skywarrior as the Navy's all weather attack bomber. The body of the phoenix in the patch is the number one which symbolizes the first west coast A-6 Intruder operational unit. The color gold is representative of the squadron's nickname, "The Golden Intruders". It was derived from the color which most aptly describes the mythological phoenix and for the geographical area in which our squadron aircraft operate, "The Golden West". The color also represents the squadron's product, i.e., the replacement flight crews and maintenance personnel, which were literally "worth their weight in gold" to the U.S. Navy's aerial offensive striking arm, in peacetime or at war. When VA-128 disestablished in 1995, the squadron patch was transferred to the Wing commander. In 1997 it was given to an newly formed EA-6B Electronic Warfare Squadron - VAQ-128. Originating as a maintenance detachment from Heavy Attack Squadron ONE TWO THREE (VAH-123), the Golden Intruders had a humble beginning. In June 1965, 100 members from VAH-123 went to NAS Oceana, Virginia, for A-6A ground maintenance training. The following January, six flight crews from VAH-123 went to NAS Oceana to begin their flight training in the Intruder. The Squadron "Plankowners" are: LT Hugh Brainard, LT Lyle Bull, LT Don Cotter, LT Robert Eichner, LCDR Buzz Eidsmoe, LT Fred Holmes, LCDR Charles Hunter, LCDR Don King, CDR Jerry Patterson, LT John Smith, LT Jim Vester, and LCDR Carl Wiechert. In June 1966, the original maintenance detachment returned to Whidbey Island to form the nucleus of the West coast A-6 training squadron. The first Whidbey Island Intruders arrived in August 1966, whereupon VAH-123 began A-6 flight training in earnest, drawing on their core of trained A-6 pilots and bombardier/navigators. The addition of combat seasoned flight crews further enhanced their experience and training capabilities and, in November 1966, VAH-123 began transition training Attack Squadron ONE SIX FIVE (VA-165) in the Intruder aircraft. By June 1967, VA-165 had become the first West Coast fleet squadron to fully transition to the A-6. On 1 September 1967, VA-128 was commissioned as the Navy's West Coast A-6 Intruder training squadron, finally severing the link to VAH-123. In the years that followed, VA-128 transitioned Attack Squadrons 52, 95, 115, 145, and 196 to the A-6 Intruder. Attack Squadrons 155 and 185 were also commissioned. In October 1986, VA-128 assumed the duties of training all U.S. Marine Corps A-6 aircrews and maintenance personnel when VMAT(AW)-202 was decommissioned. This change increased the squadron size to 80 staff officers, 95 student officers, 590 staff enlisted, and 150 student enlisted personnel. By 1988, VA-128 had grown to become the U.S. Navy's largest Fleet Replacement squadron. A permanent Medium Attack Weapons Detachment (MAWDET) for use by both A-6 FRS's (VA-128 and VA-42) was established in El Centro, California in 1988 to train aircrews in mission tactics and weapons delivery. In December 1988, VA-128 entered the computer instruction era with the opening of a new computer-based academic training building. VA-128 continued to grow, and by January 1990, was manned by nearly 1000 staff and student personnel, averaging 250 to 300 sorties and nearly 1000 flight hours per month. By May 1990, the Golden Intruders received an A-6 incorporating the newest modifications, including the new System Weapons Improvement Program (SWIP) and a high-technology carbon-fiber wing, designed to extend the plane's operational life another 10 to 20 years. Since commissioning, VA-128 has trained and carrier-qualified over 1280 Pilots and 1140 B/Ns, trained over 16,800 fleet replacement aviation maintenance personnel and flown over 197,800 hours. The squadron's honors include the CNO Safety Award for 1976, 1977, 1980, and 1983. The Golden Intruders also received two Meritorious Unit Commendations for the periods from October 1982 to January 1984 and from February 1987 to February 1989. These achievement are a testimony to VA-128's continuing superior performance in supplying the Pacific Fleet with the fleet's finest trained aircrew and maintenance personnel. There have been a total of 23 Commanding Officers of The Golden Intruders. The first, RADM W. B. Warwick served from September 1967 to May 1969. The last was CAPT R. S. Death. He served from June 1994 until September 1995. 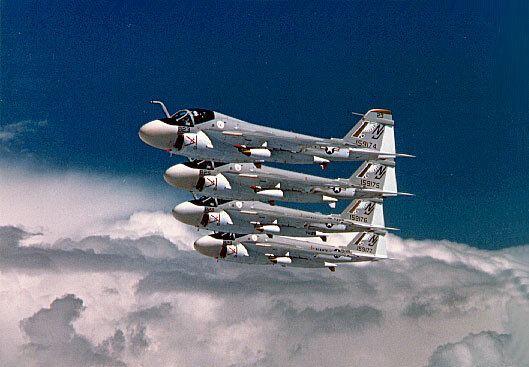 This photo was taken during a formation training flight on 25 June 1974, shortly after the arrival of the A-6E to the West Coast FRS. 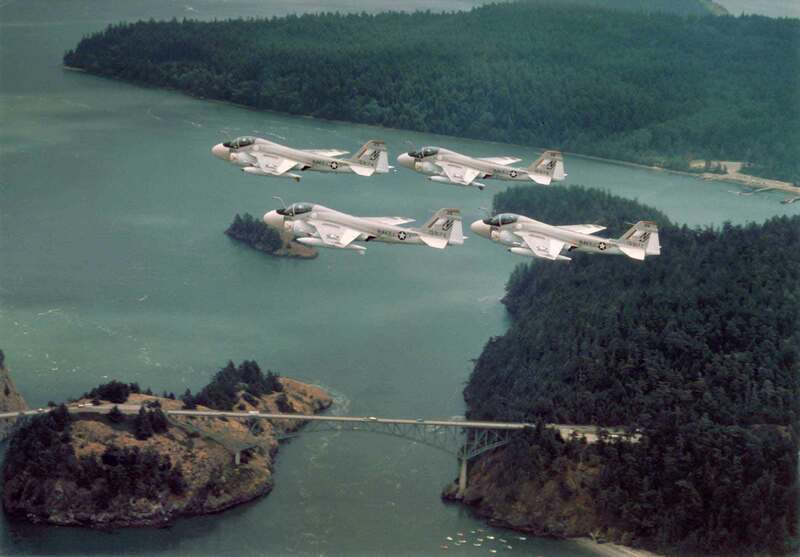 It has become the epitome of representing the Navy's presence on Whidbey Island as it merged with the Northwest culture - the RV campers crossing Deception Pass Bridge - the salmon fishermen in "the hole" - an overcast day - and the A-6 flyover. The flight crews were; #1 CDR Daryl Kerr / LT Ray Cebulski, #2 LT Bud Langston / LT Dan Wright, #3 LT Hugh Replogle / LT Tom Morio, and #4 LT Larry Yarham / FLT LT Dave Darroch. LT Fred House shot the photo with his pilot LT Don Sullivan in #5. A unique occurrence here is that all the aircraft have sequential bureau numbers, including the "photo" aircraft (159174 through 159178). Permanently on display in the NAS Whidbey Island Officer's Club is a vertical stabilizer and rudder from BUNO 152603 (complete with working anti-collision light). Listed, by year, on the starboard side are 1,937 names of Category 1 Pilots and B/Ns who have been trained throughout the thirty-two years of VA-128's existence (including that time as a detachment of VAH-123). On the port side is listed the names of GOLDEN INTRUDER aircrew plank owners and the names of the aircrew who stood The Last Watch. 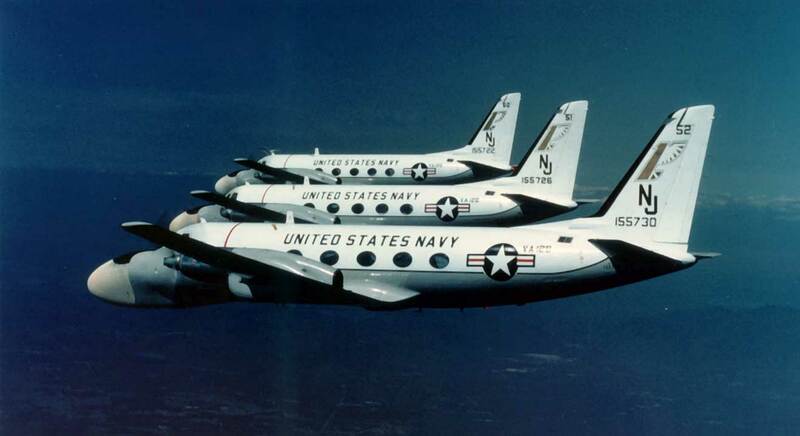 BUNO 152603 was accepted for the Navy Department by VMA(AW)-202 on June 23, 1966. It saw additional service with VA-128, VA-176, VA-85 and finally again, closing its distinguished career, with VA-128. It served during the Vietnam conflict with VMA(AW)-242 and during Operation DESERT STORM with VA-176. It was converted to an A-6E on December 13, 1973 and to an A-6E SWIP on June 18, 1990. The aircraft accumulated 5,721.4 flight hours, 842 carrier arrested landings and 843 catapult shots during her distinguished 29 year career. She finished her final flight with LT "Repete" Shafer and LT "Buckethead" McCreary in an "up & up" status. "Hey, there's a piece of tail in the O' Club with my name on it!"